It does not even seem to enter the POST. CPU is Intel Core i7-4790K which is supported by this motherboard. So is the Crucial CT102464BA160B.C16 8GiB memory module which is installed to DIMM A1 slot. Rest of the expansion cards are uninstalled. Both 24 pin ATX connector and P4 connector are connected to motherboard. I tried with two different power supplies: Chieftec GPS-400AA-101A and SilverStone SST-ST1200. I also tried to clear the CMOS both using the jumper and removing and re-inserting the CR20312 battery. Using my old MSI H81M-P33 motherboard with the same CPU, memory module and SST-ST1200 PSU everything works fine. I also connected the PC speaker to Asus B85M-G, but there are no error-code beeps. Visually, all the pins in the LGA1150 socket and the board in general looks fine. The only small defect, which I was able to detect, is a small dent on that capacitor above the PCI Express ×16 slot. What might cause such behavior? Is it possible to troubleshoot this further? have you looked at the pins in the socket? I guess the previous owner did because he has slightly modified the DIMM slots. Probably in order to fit the long graphics card. Are polymer electrolytic capacitors also prone to dry out? I thought that those have no dry-out behavior. Yes, I inspected the pins in the socket and those are at least visually perfectly fine. Try Re-seat the RAM if you didn't already. Actually, re-seat everything. I unplug/disconnect everything. Then, connect only the absolute bare minimum to run. If that doesn't work, I start swapping out components until I find the problem. If still no problem, it is something soldered to the MB that went bad. Unless, it is the BIOS settings, but I doubt it (did you change anything in there?). What is that crap between of RAM chips? Inspect pins on CPU socket with some sort of magnifier. PSU's certainly power-cycle like that at clockwork when they have a problem, or something connected to them is shorted and drawing way too much current. But PSU's will power cycle just like that, taking about a second. OK so u did list the PSU and try 2 of them (missed that) Sounds like the PSU is reacting to something bad tho, and overcurrent protection keeps tripping. Do u have a DMM and/or oscilloscope ? I did it already. In addition, I cleared the BIOS/UEFI settings. I'm pretty sure that it is something wrong with the motherboard. That is the exact setup I had in the video in my initial post except that P4 connector was also connected. It was dust. I removed it with compressed air. I did inspect pins on CPU socket using a magnifier and very good light conditions, but they seem to be perfectly fine. I came to same conclusion when I connected PSU 24-pin ATX12V 2.x connector to my known working MSI H81M-P33 motherboard, shorted PS_ON with ground and the PSU LED stayed green and PSU stayed working. When I did exactly the same with this problematic Asus B85M-G motherboard(as seen on the image, I also replaced the possibly faulty capacitor above the PCI-e slot), then the PSU started power-cycling as seen the video in my first post. I tried to measure voltages, but those did not seem to be abnormal. On the other hand, maybe my DMM simply didn't detect the reading fast enough. So I also guess that this is either a PSU over-current or short circuit protection. I do have a DMM. I don't have oscilloscope, but I could buy one if it helps troubleshooting. Is there a way to know if voltage drop value or open line is normal or not when I don't have an exactly the same board for comparison or schematic with those values? In addition, there are overwhelming number of points to measure.. I mean I could put the red probe into ground in diode mode, but where should I connect the black one? What would be a good starting point? The only odd thing, that I noticed, is that in case of Asus B85M-G, the +12V is 1.291 when measuring on the 24-pin connector, but it was 1. (should mean open line) when I measured on P4 connector. I did exactly that. 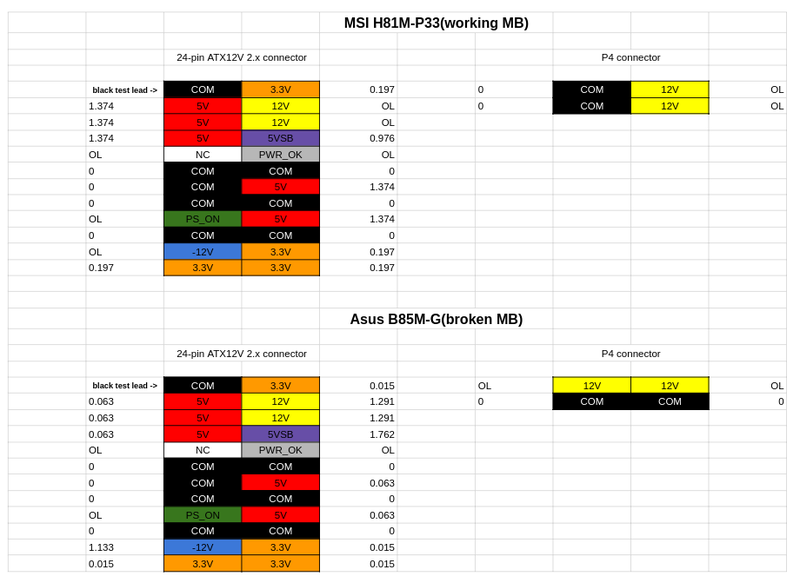 Known working MSI H81M-P33 motherboard didn't powercycle while the problematic Asus B85M-G did. That looks like a 5V and/or 3.3V rail short to ground somewhere, those values are waaay too low. The MSI values are a bit more normal (around a 1-2 PN junction forward voltages, which gives anything between 0.2 - 1.5V, depending on the type of component connected). 0.015V is effectively a dead short, you are measuring a voltage drop across the wires/traces only. You can also reverse the probes and compare the values - if they stay the same low value, it is almost certainly a short. A good PN junction would show a forward voltage in one direction and open circuit (OL) or a higher value in the other. However, do make sure you let the measurement stabilize before writing the value down - there are tons of capacitors connected between the power rails and ground and those will affect the reading while they are charging up or discharging. A dead short on one of the power rails would definitely explain your power supply behavior (restarting/oscillation). Yes, I let each measurement to stabilize at least 10 seconds. So probably a component on 3.3V and/or 5V trail is shorted? Is there a way to find out which one? I have seen videos where people apply some current to trace and look for a hot component. That's going to be a tough one, especially when you don't have a schematic of the board and it is a multilayer board. You could apply power from a power supply, but unless you have a thermal camera that is going to be looking for a needle in a haystack. Even with a camera it is not guaranteed, it could be a tiny capacitor shorting somewhere and difficult to find with a consumer-level camera. I would start checking all the local power regulators for the CPU, chipsets, etc. However, it could literally be a blown bypass cap in some odd corner causing the issue. Or it could be e.g. a blown USB controller or some part of the CPU chipset. Then you would be in a world of pain. I am not sure I would go into hunt like that, that's going to take a very long time, with no guarantee of result. Given the price of a new MB I doubt it is an economical repair. Of course, if you want to do it for learning purposes, by all means. I applied power from the motherboard and carefully touched the every inch of the motherboard, but didn't feel any abnormal heat. I'm afraid I need to give up at this point. However, thank you everybody for sharing your knowledge! You would need to provide a lot of current for anything on the board to get hot. Keep in mind that a computer motherboard is designed to take amperes of current on each rail, in addition to what the CPU and the GPU(s) take. Was that measurement with power supply plugged? 3.3 and 5V should not be correlated with each other. Im trying to come up with a scenario that could cause that and hmm, fried voltage monitoring chip? even 12 and -12 are pulled down. Can you measure straight resistance on 12 -12 3.3 and 5? you cant do that with ATX supply since its powercycling, and standby doesnt count. You would need 3 lab supplies set to 3.3, 5 and 12. I would be reluctant injecting just one rail, stuff doesnt like that (latchup). Given the price of a new MB I doubt it is an economical repair. Only if you don't value your time - and that assumes it is something actually repairable by a home gamer. Did you verify that nothing is underneath the mobo, shorting any of the connections? Are you using plastic standoffs or metal? Did you disconnect all fans?